Today I’m taking you back to June last year when I visited Amsterdam for World of Coffee. 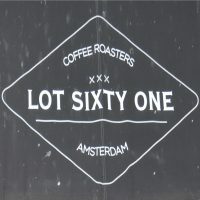 Other than the festival itself, my first experience of Amsterdam’s speciality coffee scene was Lot Sixty One Coffee Roasters. Set on the canal-side, on a corner by a bridge, I’m not sure there’s a more stereotypical location for an Amsterdam coffee shop and it was a perfect first introduction. Split between a small front section and a slightly larger rear basement, this is the original Lot Sixty One, with a second branch having opened inside the Urban Outfitters clothing store on Kalverstraat. Despite the name, and the presence of a roaster in the basement during my visit, Lot Sixty One roasts at a new, appointment-only facility in Amsterdam, so this is now just a coffee shop (although “just” hardly does it justice). On the plus side, this means that there’s more room for seating, good news given its popularity. There’s a house-blend on espresso, where it’s joined by a single-origin for the smaller drinks (espresso, flat white and cortado), plus there are single-origin pour-over and batch-brew options. If you’re hungry, there’s a decent selection of cake. Finally, it’s cashless, so bring a card!